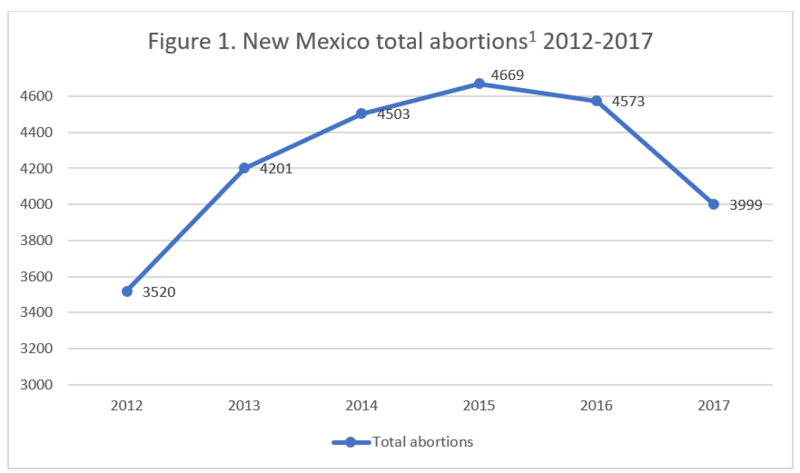 New Mexico’s abortion statistics for 2017 were published as part of the annual selected health statistics report in January 2019. 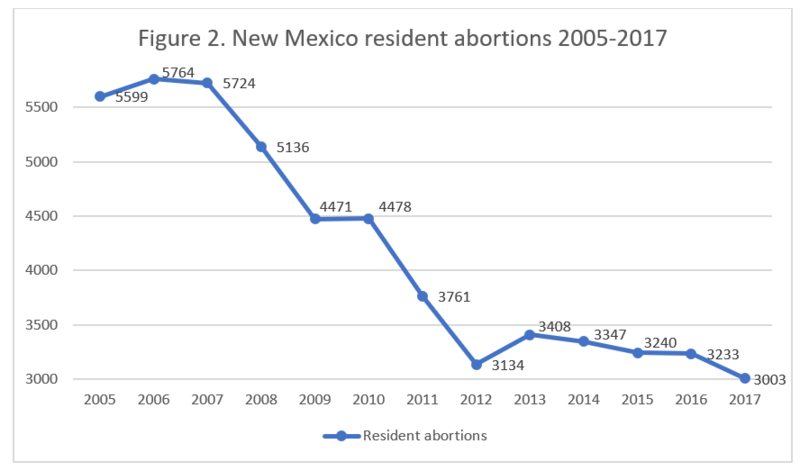 The report shows that abortions in the Land of Enchantment have continued to decline. *Total abortions occurring in New Mexico. This information was provided to CLI by the New Mexico Department of Health upon request. Information on New Mexico’s chemical abortion totals and state abortion rate and Planned Parenthood’s New Mexico market share is not publicly available. In 2017, there were 3,999 abortions reported in New Mexico, including residents and non-residents. Total abortions dropped by 13 percent from 2016, when 4,573 abortions were reported (Fig. 1). Abortions performed on residents fell by seven percent from 2016 (Fig. 2). New Mexico does not report how many of these abortions were chemical abortions. 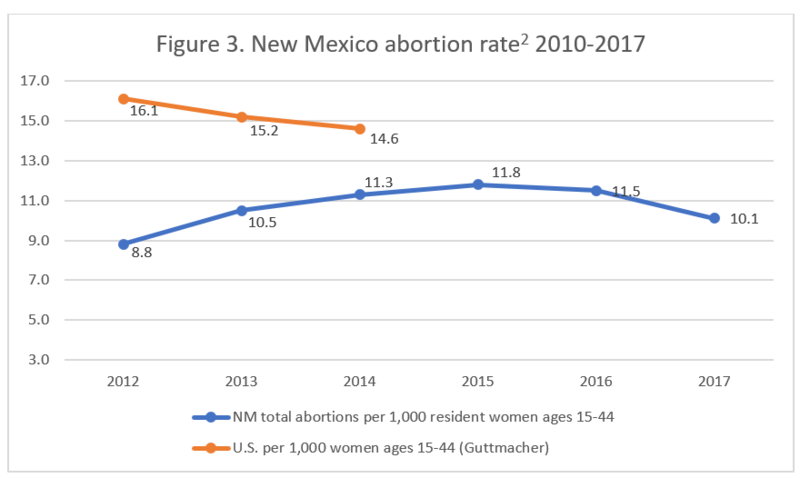 Similarly, New Mexico does not report the state abortion rate, although the Charlotte Lozier Institute estimates that the rate was 10.1 abortions per 1,000 women age 15 to 44 in 2017 (Fig. 3). The total number of abortions in New Mexico is not included in the state abortion report, but the New Mexico Department of Health provided this information to CLI upon request. The information in New Mexico’s abortion report is limited, with data provided for abortions performed in New Mexico on New Mexico residents only. In 2017, 75 percent of the abortions reported in New Mexico were on resident women. Three percent of the abortions were performed on women of unknown residency. Over half the abortions performed on New Mexico residents were on women in their twenties (55 percent), and more than a quarter were on women in their thirties (27 percent). Eleven percent of the abortions were performed on women age 19 or younger, and three percent were performed on women age 40 or older, with an additional three percent performed on women of unknown age. Fifty-two percent of the abortions were performed on Hispanic women. Twenty-seven percent were performed on white women, and 11 percent were performed on American Indian or Alaska Native women. Black women underwent three percent of the abortions, and Asian or Pacific Islander women underwent one percent. Five percent of the abortions were performed on resident women of unknown or other races. Two-thirds of reported abortions were performed at eight weeks of gestation or earlier. Fifteen percent occurred between nine and 13 weeks, while three percent were performed between 14 and 15 weeks and one percent between 16 and 17 weeks. One percent of the abortions performed on New Mexico residents occurred between 18 and 20 weeks of gestation, and an additional one percent occurred after 20 weeks, the point at which unborn babies are known to feel pain. Gestational age was not reported for 12 percent of the abortions. It is likely that late-term abortions are underrepresented in New Mexico’s abortion report because information is included for resident women only, excluding abortions performed on women who travel to New Mexico from other states, especially for very late abortion procedures. As many neighboring states pass commonsense laws to protect mothers and unborn children, New Mexico has become a destination for out-of-state women seeking abortion – the Albuquerque Journal describes the state as an “abortion magnet.” In 2012, 89 percent of the abortions performed in New Mexico were performed on state residents. By 2017, that percentage had dropped to 75 percent. Although New Mexico does not report which states women travel from, it is likely that many make the trip from Texas. Texas passed laws improving safety standards for abortion facilities and requiring abortion doctors to have admitting privileges with hospitals to allow for uninterrupted care for patients in the event of an emergency. Many abortion clinics in the state were unable to meet the safety requirements. Although the laws were ultimately overturned by the Supreme Court, many abortion clinics had already closed by the time the court made its ruling. Texas also limits abortion after 20 weeks, or five months of pregnancy, when babies are capable of feeling pain. By contrast, New Mexico places no limits on how late in pregnancy an abortion may be performed and is home to one of the few abortion facilities that performs abortions throughout all nine months of pregnancy. Unlike the nearby states of Texas, Arizona, Oklahoma, Colorado, Utah, and Kansas, New Mexico has no parental notification or consent process to protect minor girls considering abortion. Similarly, unlike Arizona, Kansas, Oklahoma, Texas, and Utah, New Mexico has not outlined an informed consent process to ensure women seeking abortions are fully informed. Oklahoma, Texas, Kansas, and Arizona have all limited abortions after 20 weeks, although Arizona’s law is blocked by a court order. In 2016, CLI published a study on abortion reporting among the 50 states, New York City, and Washington, D.C. New Mexico’s reports were ranked 42nd best in overall quality, and New Mexico has many areas where its reporting could be improved. Perhaps most relevant, New Mexico could include in its reports information on all the women who get abortions in the state, rather than providing statistics for residents only. New Mexico collects many data points that it does not include in its annual reports, including the state and county of residence, marital status, level of education, and previous pregnancies of women who get abortions. New Mexico records the types of facilities where abortions occur and the procedures used, although this information is not published in its reports. Simply by incorporating more of the data it collects, New Mexico could make its reports more valuable to researchers. New Mexico could also begin to collect information on complications resulting from abortion – particularly since the likelihood of complications rises with gestational age. New Mexico’s selected health statistics report contains information on resident abortions performed in-state only. The New Mexico department of health provided in-state abortion totals for 2012-2017 to the Charlotte Lozier Institute upon request. New Mexico does not report the state abortion rate. Rates were calculated by the Charlotte Lozier Institute using population estimates from the United States Census Bureau. The rates were calculated using the following formula: (Abortions performed in New Mexico ÷ number of resident women ages 15-44) x 1,000.